BANGI, 31 Oct 2013 – University Malaya (UM) emerged the overall winner in The Inter University Lawn Bowling Championship – Triples 2013 and The Inter University Staff Lawn Bowling Championship – Mixed Triples 2013. Collecting one Gold for the Boys Triples category and one Silver for the Girls Triples category, UM were crowned the overall winner of the competition. They received the Championship Trophy along with individual prizes. 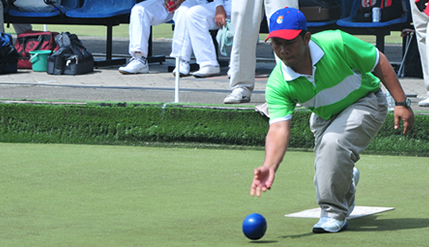 The Lawn Bowling tournament was organized and hosted by The National University of Malaysia (UKM). The competition between institutes of higher learning, from Universities, Community Colleges to Polytechnics, is to discover new talent from within the student body as well as to promote the Lawn Bowling sport, said Deputy Vice Chancellor (Alumni and Student Affair) of UKM, Prof Dato’ Ir Othman A. Karim at the closing ceremony at the Lawn Bowling Sports Complex, at Seremban 2, Negeri Sembilan recently. Prof Othman said that the tournament was also to promote a healthy competitive nature among the students and was also a good way to cultivate cooperation and friendships between the institutions, their staff and students. Those who took part were Kota Kinabalu Polytechnic Sabah, University Malaysia Kelantan (UMK), University Malaysia Terengganu (UMT), University Islam Malaysia (USIM), University Teknologi Malaysia (UTM), University Tun Hussien Onn Malaysia (UTHM), University Teknologi Mara Malaysia (UiTM), University Kebangsaan Malaysia (UKM), University Malaya (UM) and Ministry of Education (KPN). Altogether a total of 40 teams took part. UKM reached the quarter finals with the Girls Triple team but lost to the UiTM Girls Triple team by 17 – 7, gaining 6th place in the overall standings. The finals saw UiTM meeting UM in the students Girls Triples, UM against UTM in the students Boys Triples and UiTM against UTM in the Staff Mixed Triples. Dato Othman handed over the prizes to the winners, accompanied by Director of UKM Sports Centre Dr. Tajol Arifin Mohd and the Vice President of the Lawn Bowls Malaysia, Supt. Syed Zainal Abidin. For the Staff’s Mixed Triples, the winners are: UiTM receiving RM1000 and Medals with UTM second receiving RM700 and Medals and UM third receiving RM500 and Medals. Winner: UiTM received RM2000, Medals and Trophy. Second: UM received RM1500 and Medals. Third: UTM team (A) and UTM team (B) received RM800 and Medals. Winner: UM team (A) received RM2000, Medals, and Trophies. Third: UiTM team (B) and UMT team (B) shared RM800 and Medals.